On a recent visit to Terowie in the mid-north of South Australia I took several photos of the old E.S. & A. Bank in the main street. This old building was built in 1884 in the heyday of this important historic, rural town. 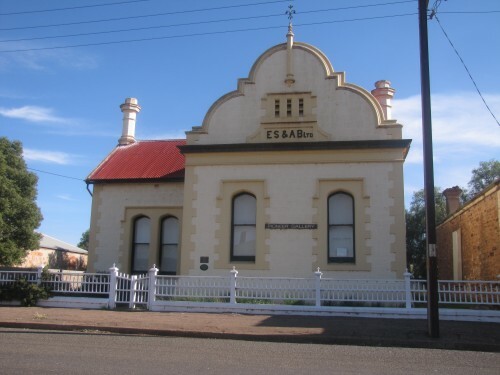 The 1880s saw this town boom in size due mainly to the rapidly expanding agriculture in the region as well as the establishment of the railway lines serving this area. The photo below shows the bank in 1909. 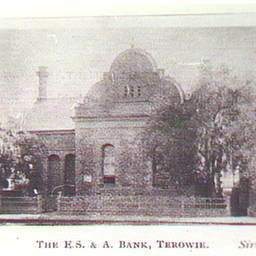 The photo appears on the State Library of South Australia Terowie collection which shows many historic photos of the town (click here to view). The building today is used as a Pioneer Gallery. As an interesting aside I was not aware of the meaning of the letters in the name of the bank until I did some research. E.S. & A. Bank’s full title was the English Scottish and Australian Bank. There were many branches in Australia in earlier times. The first was opened in 1853 in Sydney. The bank merged with the Australia and New Zealand Bank (ANZ) in 1970 to become the Australia and New Zealand Banking Group. Over the last week or so I have shared more articles and photos of Terowie. Look back through my posts to read them, or go to the archives link above. On a recent visit to Terowie in the mid-north of South Australia I took the two photos shown on today’s post. They show the two newspaper buildings of the town, both established in the 1880s. The two newspaper buildings are separated only by the local blacksmith building which a featured here a few days ago. The town’s population once reached 700 and served a vast agricultural region. Today only about 200 people live in the town and district and many factors have seen its decline. It is no longer a railway centre and farming has proved to be marginal at best, even in good years of rainfall. 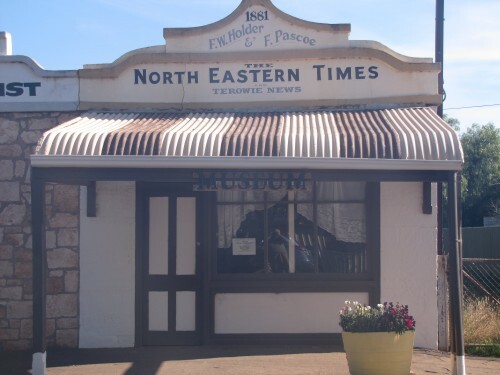 The Terowie Enterprise must have been an interesting newspaper. You can read about it here and below I have included a quote from the paper. During Joseph Pengelley’s ownership there was much discussion about “moral” issues. An 1887 editorial titled “Base immorality” used the strongest terms to attack a family involved with the “seduction” of a young girl at Petersburg (7 October 1887, p.2). Pengelley also wrote articles against alcohol, gambling, and church interference in politics. If you look closely at the photo below of the North Eastern Times newspaper building it now has a ‘museum’ sign in the window. Next time I am in the area I must take more time to explore the town more, including visiting the museum. 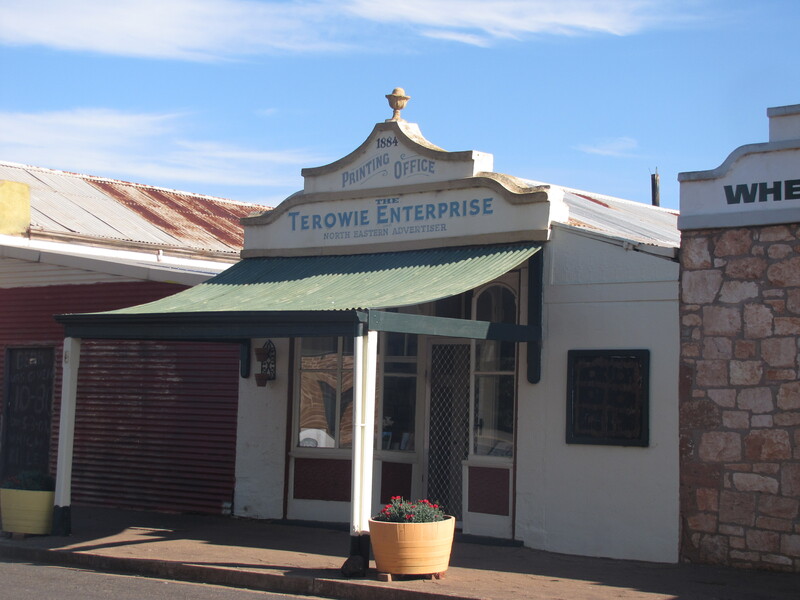 The Terowie Enterprise – details about the newspaper, including a facsimile of a page from the paper (which I cannot publish here due to copyright). 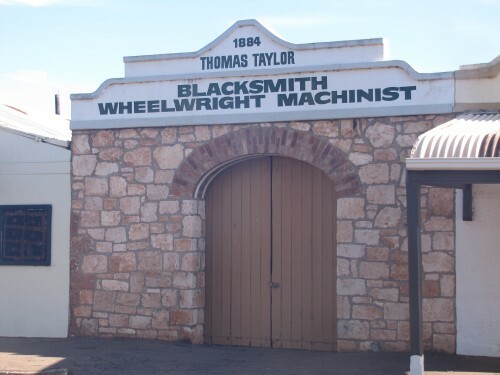 In the 1880s through to the early 1900s the township of Terowie in the mid-north of South Australia was a bustling place of activity. The town was an important railway centre for many years as the state thrived and expanded. The town also served a growing farming community there and further afield. 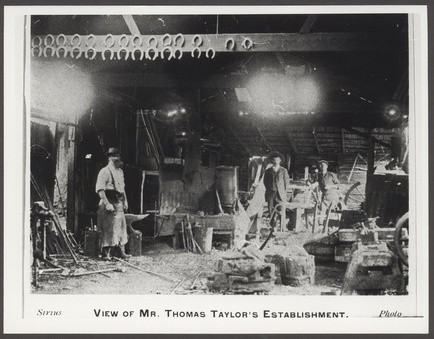 Consequently, the town blacksmith opened in 1884 and operated by one Thomas Taylor, was an important business in the district. I find it interesting that the building has been maintained and obviously restored to something of its former state. It shows a certain, commendable level of care and pride on the part of the current owners – or perhaps the community which desires to preserve the interesting history and heritage of the town. One source I found states that the blacksmith building is now a museum. It was closed when we went through recently. Terowie became a large military camp in 1941 -1946. In March 1942 General Douglas MacArthur gave his first Australian press interview in Terowie after leaving the Philippines. His most famous statement was “I came out of Bataan and I shall return”. Terowie – from the website of The Age newspaper – much information about the buildings and sights of the town. The magnificent building shown in today’s photograph was the original town hall in Peterborough in the mid-north of South Australia. It was built in 1884 as a private building. 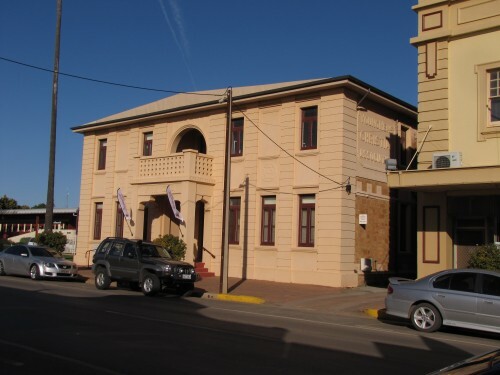 From 1889 it was used as the Town Hall until the new, current Town Hall was opened in 1927 – you can see the current town hall to the left of the old building. This building, in addition to serving as the town hall, has been variously used as a museum, library, courthouse and even a skating rink. It is now a private residence. You can read more about this building here. While on a recent visit to relatives in Peterborough in the mid-north of South Australia, I took time out one sunny afternoon to take a few photos of some prominent features of the town. Over recent weeks I have been sharing these photos and writing about the various features of this once well established railway town. 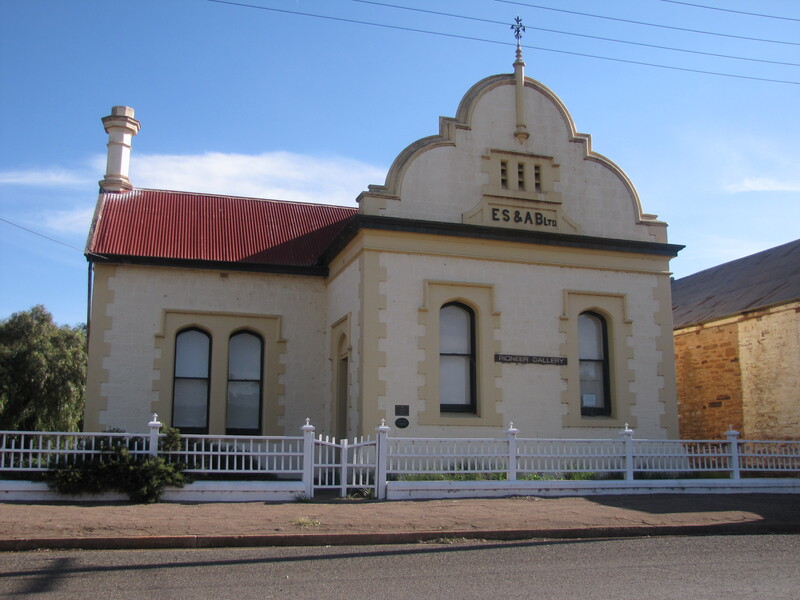 One of the beautiful buildings in the main street is the YMCA Building, right next to the Town Hall which I will feature in the coming days. This building no longer serves its former use and is now an important tourist attraction for what it contains. 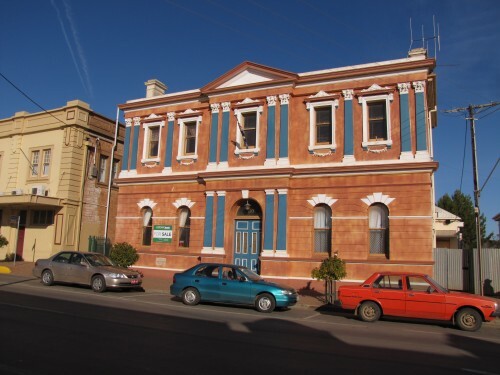 In the middle of the town, between the Visitor Information Centre and the Town Hall, the historic former YMCA building has sprung back to life as a museum. Downstairs houses a unique display of MELDONFIELD Miniatures, created by Mary & Eldon Zimmermann. The must-see attraction is the original Petersburg Railway station, situated in the foyer of the main entrance, which has been rebuilt on a scale of 1:12 from the original stone, bricks and wood salvaged by Eldon. Historic Cobb & Co coaches made by Eldon with Mary’s miniature people, also to scale with the coaches, are on display as well as the huge number of tools and plans which have been used to create these fascinating miniatures. It is truly a wonderful collection for those people who appreciate such attention to detail in miniature making and for those interested in the history of transportation. Upstairs in this building the Peterborough Historic Group has painstakingly bought the “single men’s” rooms back to original condition and in each of the rooms are housed artefacts associated with the history of “Petersburg to Peterborough” and the surrounding region. Set your mind wondering to how people use to live and experience a taste of a life long gone. Open daily from 9am to 4pm except Christmas. I have seen parts of this exhibition and can thoroughly recommend a good look – both visitors and locals alike. You are currently browsing the archives for the Museums category.